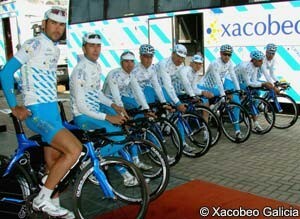 After several months of delays, the riders and staff of the Xacobeo Galicia team have finally been given the remainder of their salaries, thus bringing to an end a long battle to receive the money. The final four months have been handed over to those concerned, with the Galego Cycling Foundation finally coughing up one day before a UCI-enforced deadline. Had it not paid up, the UCI would have handed over the three month bank guarantee paid at the start of the year, and started charging the foundation interest. The riders and staff experienced a long delay earlier this year, only getting the money before the start of the Vuelta a España. That was the biggest race on the team’s calendar, and it was important for the team’s unity that the amount owing then was paid up before the start of the race. The team had originally hoped to continue into 2011, and was hunting for new backers. Any hope that it could secure something for next season was dealt a big blow, however, when Vuelta stage winner and runner-up Ezequiel Mosquera and twelfth-placed finisher David Garcia Da Pena tested positive during the race. Analysis of urine samples showed that both riders’ A samples contained the banned substance Hydroxyethyl starch; Garcia Da Pena subsequently tested non-negative for EPO. While the future is very uncertain for both of them, it is reassuring that their team-mates and staff members will get what they are owed.